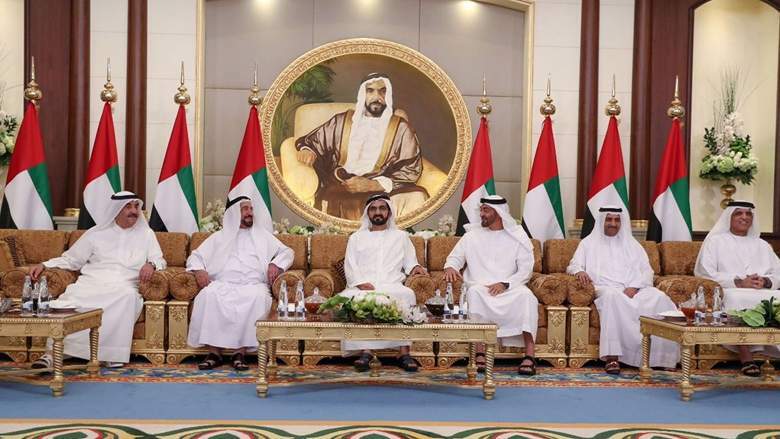 Their Highnesses the Supreme Council Members the Rulers of the UAE and the Crown Princes gave their most sincere greetings, blessings and wishes to President His Highness Sheikh Khalifa bin Zayed Al Nahyan on the start of the Holy Month of Ramadan. They prayed to Allah Almighty to continue to grant His Highness good health, while greatly valuing his diligent efforts in raising the nation's stature, strengthening its accomplishments and gains, and achieving the aspirations of his people for happiness, improved welfare, security, stability and a dignified living. This came during today's reception held at the Al Mushrif Palace by Vice President and Prime Minister and Ruler of Dubai, His Highness Sheikh Mohammed bin Rashid Al Maktoum, and His Highness Sheikh Mohamed bin Zayed Al Nahyan, Crown Prince of Abu Dhabi and Deputy Supreme Commander of the UAE Armed Forces, for Their Highnesses the Supreme Council Members the Rulers of the Emirates and Their Highnesses the Crown Princes and Deputy Rulers. In Al Mushrif Palace in Abu Dhabi, Their Highnesses received HH Dr. Sheikh Sultan bin Mohammed Al Qasimi, Supreme Council Member and Ruler of Sharjah; HH Sheikh Hamad bin Mohammed Al Sharqi, Supreme Council Member and Ruler of Fujairah; HH Sheikh Saud bin Rashid Al Mu'alla, Supreme Council Member and Ruler of Umm Al Qaiwain; and HH Sheikh Saud bin Saqr Al Qasimi, Supreme Council Member and Ruler of Ras al-Khaimah. Their Highnesses also received the Crown Princes and Deputy Rulers, with the attendance of HH Sheikh Hamdan bin Mohammed bin Rashid Al Maktoum, Crown Prince of Dubai, and HH Sheikh Hamdan bin Rashid Al Maktoum, Deputy Ruler of Dubai and UAE Minister of Finance. His Highness Sheikh Mohammed bin Rashid Al Maktoum and His Highness Sheikh Mohamed bin Zayed Al Nahyan each received HH Sheikh Abdullah bin Salem bin Sultan Al Qasimi, Deputy Ruler of Sharjah; HH Sheikh Ammar bin Humaid Al Nuaimi, Crown Prince of Ajman; HH Sheikh Mohammed bin Hamad bin Mohammed Al Sharqi, Crown Prince of Fujairah; HH Sheikh Rashid bin Saud bin Rashid Al Mu'alla, Crown Prince of Umm Al Qaiwain, and HH Sheikh Mohammed bin Saud bin Saqr Al Qasimi, Crown Prince of Ras al-Khaimah, who were accompanied by several sheikhs and officials. Those in attendance exchanged their greetings for the beginning of the Holy Month of Ramadan, while praying to Allah Almighty to provide goodness and blessings during this Holy Month for the UAE and its people, and to continue to grant the nation with the blessing of wealth, advancement, security and safety, in the shadow of the leader of its journey, President His Highness Sheikh Khalifa bin Zayed Al Nahyan, with his gentle hands and generous humanitarian initiatives, both inside and outside the nation. They also valued the directives of His Highness for this to be the Year of Giving, to establish the noble values of love, giving, solidarity and mercy that were sown by late Sheikh Zayed bin Sultan Al Nahyan, while highlighting that these initiatives have strengthened the civilised values and humanitarian giving that are rooted in the souls of the Emirati people. Their Highnesses the Supreme Council Members the Rulers of the UAE and the Crown Princes, Deputy Rulers and Sheikhs performed the Maghrib prayer as a group. Afterwards, they ate and broke their fast. His Highness Sheikh Mohamed bin Zayed Al Nahyan earlier received His Highness Sheikh Mohammed bin Rashid Al Maktoum and HH Sheikh Hamdan bin Mohammed bin Rashid Al Maktoum, as they exchanged greetings and blessings for the start of the Holy Month of Ramadan, while asking Allah Almighty to return his blessings to the UAE's leadership and people for greater advancement, progress and glory, and his goodness and blessings to Arab and Islamic nations. In attendance were a number of Sheikhs, ministers and senior officials.